Many anglers target walleyes because they make great table fare. Even in the best of situations, walleyes generally do not jump in the boat. Anglers must work to catch them. 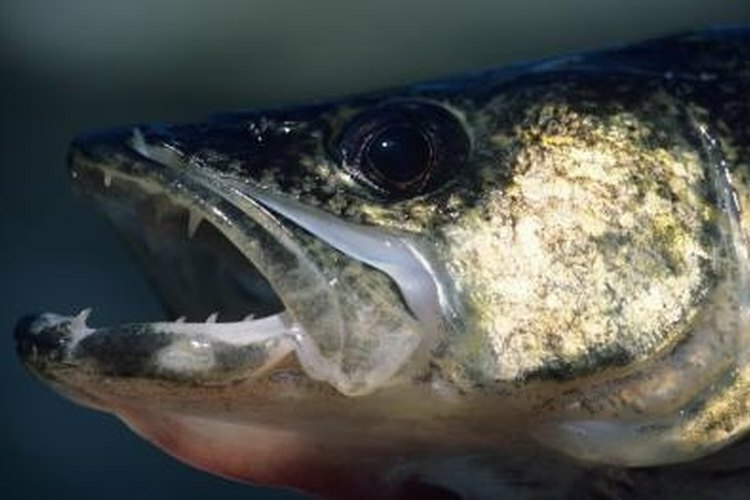 Their eyes are sensitive to the sun and walleyes can be finicky eaters, too, especially during and after a cold front. But walleyes remain a popular game fish -- and in Minnesota, they are the state fish -- because they have white meat that makes a great meal. They prove challenging to catch, too, so many anglers go home happy after catching a walleye or two for dinner. Pack the three most productive live baits for walleyes -- leeches, minnows and night crawlers. While all can work at anytime, minnows tend to work best when the water temperature is 65 degrees or lower. Rig a 6- to 7-foot rod and reel with 4- to 6-pound test fishing line. Create a Lindy rig to present the live bait. Cut a 36- to 48-inch length of line off the main line. Slide a 1/4-oz. sliding sinker onto the end of the line, and then tie a barrel swivel onto the line. Attach the section of line you just cut to the other end of the swivel. Tie to the end of the leader a size 2 hook to fish with minnows, a size 4 hook to fish with night crawlers and a size 6 hook to fish with leeches. Tie a 1/4-oz. lead-head jig to the end of the fishing line on a second rod and reel combination, if you have one. Take the water temperature into consideration as you search for walleyes. When the temperature drops to 55 degrees F or lower, you'll likely find them around shallow areas with rocks and moving water. Emerging vegetation beds attract walleyes as the water temperatures rise through the 60s and, once they hit the 70s, deeper areas like drop-offs, humps, reefs and weed edges become better. Drop the Lindy rig and bait to the bottom. Drift or troll through likely areas, making sure your rig stays on the bottom. Continue moving until you locate fish. Set the hook with a sweep of the rod when you detect a bite. Walleye bites on Lindy rigs, so subtle at times, may only feel like additional weight. Mark the spot where a walleye bites. The fish congregate in schools, so where you catch one you often can catch at least one more. Work the area more thoroughly with the Lindy rig, or put a piece of live bait on a jig and cast it into the area. Switch to a heavier sinker or jig head if you have trouble feeling the bottom with a 1/4-oz. weight.